The point of departure is the charming mountain town of Crested Butte. Hwy. 50 runs east-west through Gunnison, in Gunnison, drive north about 30 miles to Crested Butte. Now, if leaving the town of Crested Butte, as if going back to Gunnison, just outside town on your right hand side, there is some sort of utility plant. Turn right into what appears to be a large (parking?) area, then park on your left side - away from the buildings. This is the Baxter Gulch Trailhead, location N38.86065, W106.97332, elevation about 2720 meter. Cross the flat fields while staying right, that is pretty close to your uphill slope on the right hand side. Curve right as you contour into the very distinct Baxter Gulch. Continue skiing near the creek, that is in the bottom this narrow valley, as your next section of travel. There are some trees and obstacles, but overall this goes well. After a while, you will notice a very clear V-shaped side valley forking left and climbing. Its distinct feature is that there are no trees growing in the bottom part of the valley, only higher up on its sides. This is the key to further progress. Ski this valley until it runs back into the trees, continue through and traverse slightly uphill crossing a fairly short forested section. You will then emerge into another open slope that stretches uphill on your left. Ski up here, then traverse right. Cross uphill among smaller and sparser vegetation until reaching the open slopes that extends up the mountain. 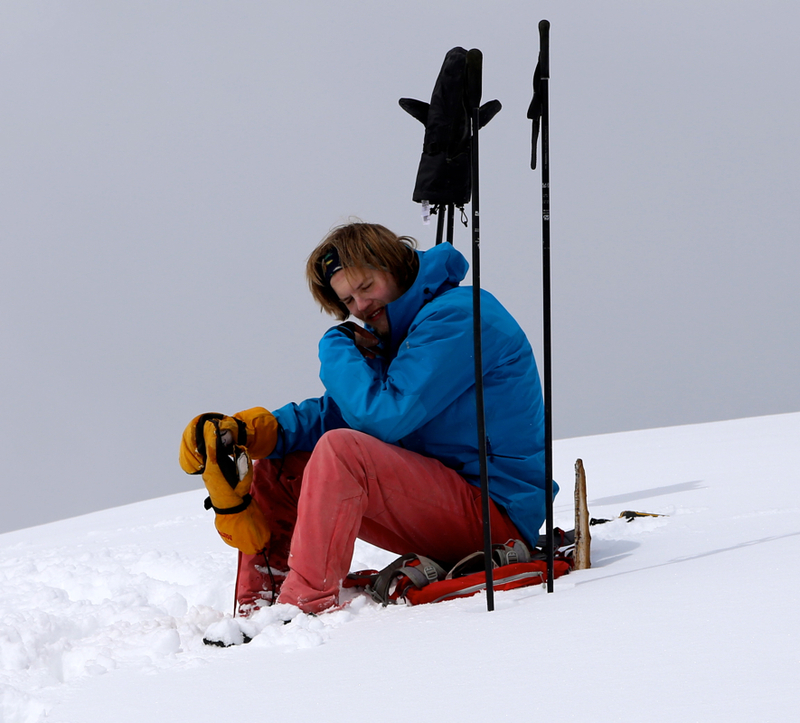 Evaluate possible avalanche danger when finding your line uphill. Continue uphill, gradually more right until you hit a main ridge that extends up to the very summit ridge. Depending on the snow conditions, you may leave your skis here or continue higher, possibly on the slope just right of the ridgeline. Once you reach the summit ridge, traverse it to the far end where the highest point is marked. On the way there, you will pass across one small hump that may be nearly as high. 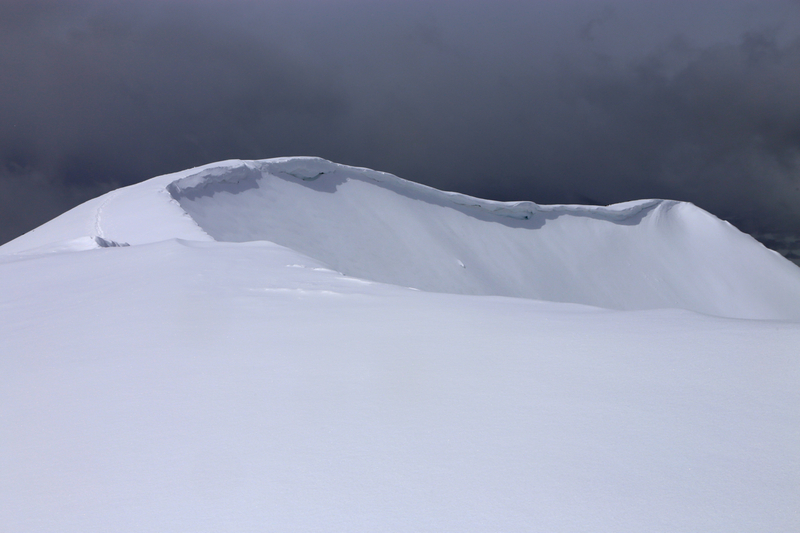 The ridge is corniced on your left as you traverse towards the summit. Pål and I started out at 0915. 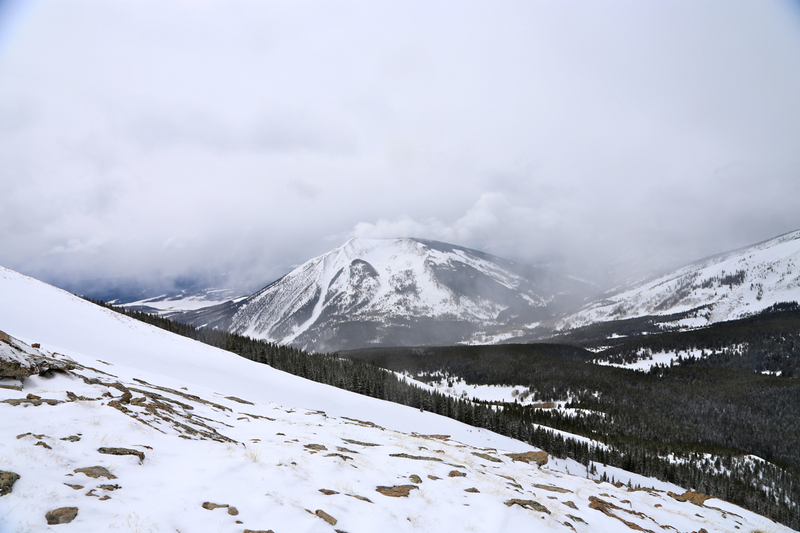 It was not entirely obvious that this Baxter trail was supposed to give skiers access to the National Forest, however, there is little point in working hard to establish a trail across private land, then not to use its main purpose: legal access to the mountains in all seasons. 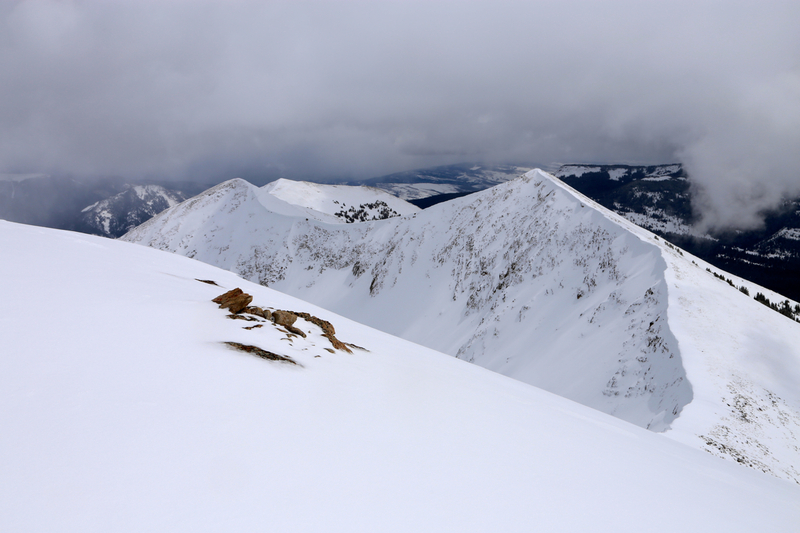 Without more consideration of local issues that we in any way were unlikely to comprehend, we skied across the open fields aiming for the Baxter Gulch. The skiing up the gulch was a bit messy, but not bad. We eventually arrived at a fork with a promising valley going left. 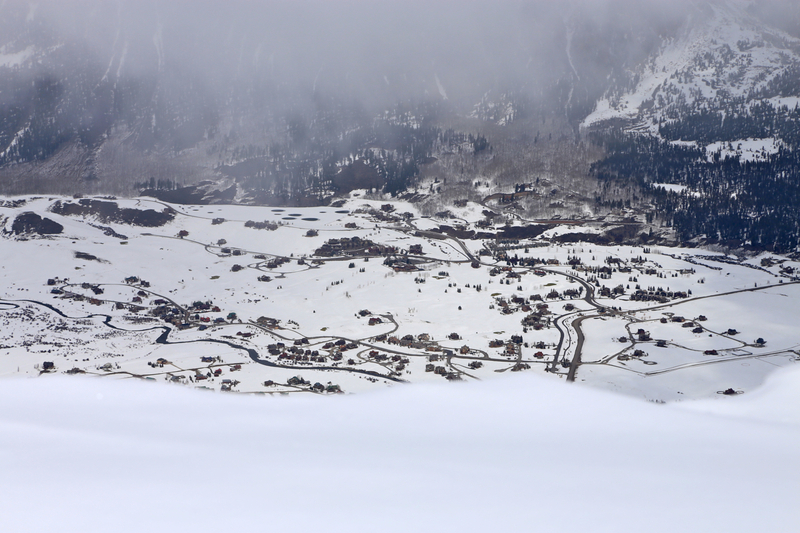 The good thing was that this small valley was easy to ski without any trees. 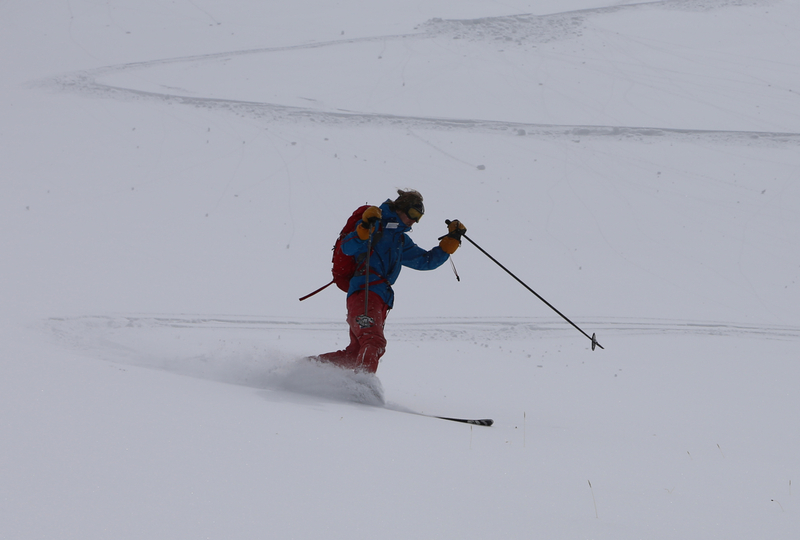 We made good progress as we decided to ski directly uphill, a big promising slope with safe snow. Rocks were visible on both sides, it was clear that the snow was pretty shallow and little, if any avalanche hazzard existed. We topped out on a ridge with little snow. Our best option was to continue up along this ridge, on foot. This was pretty easy and soon, we reached the horizontal summit ridge. Walking to its far end, we discovered a tiny wooden stick, most likely the upper few centimeters of a marker on top of the cairn. 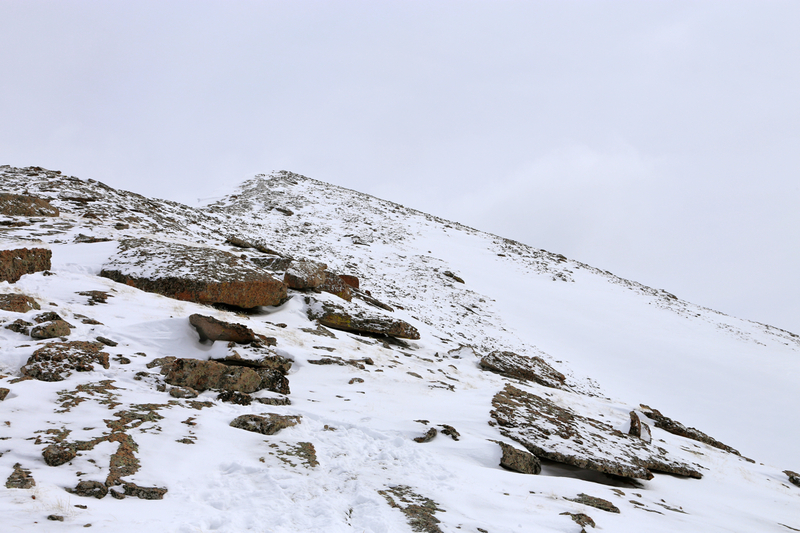 The continuation of the ridge was clearly lower. The time was 1345, we enjoyed the landscape and the good views before starting our return at 1400. The skiing back down was very nice indeed. 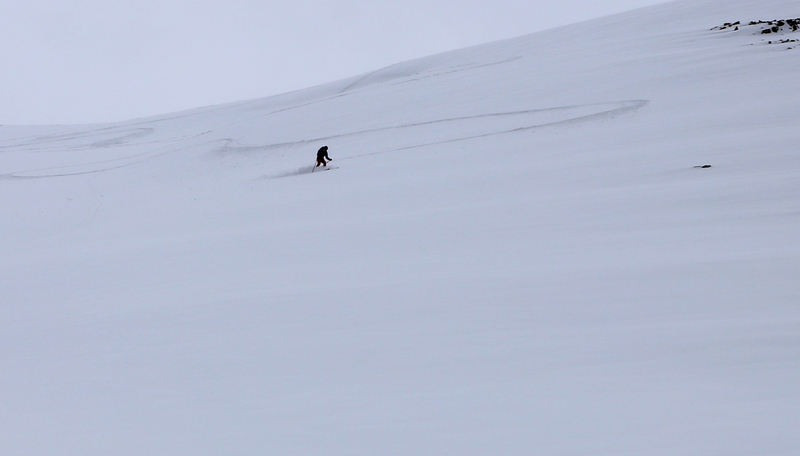 Deep powder and a reasonably steep, long slope. We had fun and many nice turns were left behind on the slope. Skiing back out was all easy and we were back at the car by 1545.